Houston has been messed up by the severe hurricane Harvey recently, and we are so worried about our clients who are residing in the area. After contact with them, we found that some clients had avoided the disaster perfectly because of proper preparation in advance. They count it as luck because no one could forecast such terrible situation until it actually comes, but still, we could have a quick view at what we can do for the next time. Data centers are vulnerable to water corrosion. 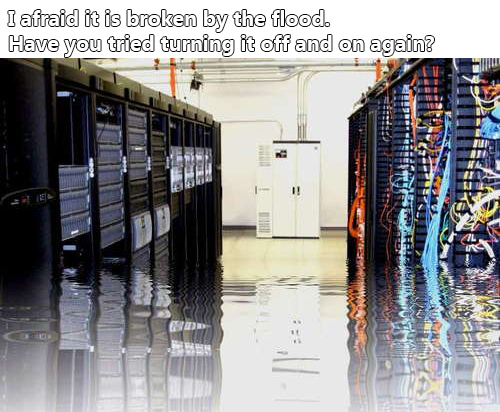 It’s heartbreaking to have data center broken down by the flood, especially for those people who work for it, it means they might need to start looking for a new job. A data center is a facility used to house computer systems and associated components, such as telecommunications and storage systems. Since the introduction of the European Union directive on the Restriction of the use of certain Hazardous Substances (RoHS), keeping data centers free of harmful corrosion has become more challenging. Excessive corrosion often leads to electronics warranty non-compliance, circuit board failure, ghost signaling, and even complete failure of electronics components. Put simply, data center corrosion increases the potential for downtime and raises maintenance demands, both of which can significantly hurt the bottom line. Inflatable Barrier could help in this case. Relocating a data center to higher ground may eliminate flooding as a serious issue, but it may increase the data center’s exposure to high winds and lightning strikes. If the data center is located near a flood-prone region of the Mississippi River, for example, the tradeoff may be reasonable. If the data center is located in “Tornado Alley,” seeking higher elevation may be contraindicated. Some of our clients chose inflatable barriers (Image Below) to protect their data center by simply line them up as a circle. It might work but the shortage is that you need to have space big enough to store them. 10Gtek concerns what clients concern and has been satisfying clients worldwide for many years by outstanding quality and service. Almost all the compatible products like the transceiver, DAC, AOC could be found on the 10Gtek’s official store SFPcables.com and 10Gtek’s Amazon store. DAC VS AOC, Who is the Best Interconnect Technology on the Next Generation Data Center?